The culmination of four decades of research and service on behalf of Congress, Louis Fisher's latest work is a fitting capstone to a remarkable career as scholar and writer and presents his most articulate, passionate, and persuasive defense yet of Congress as an institution. 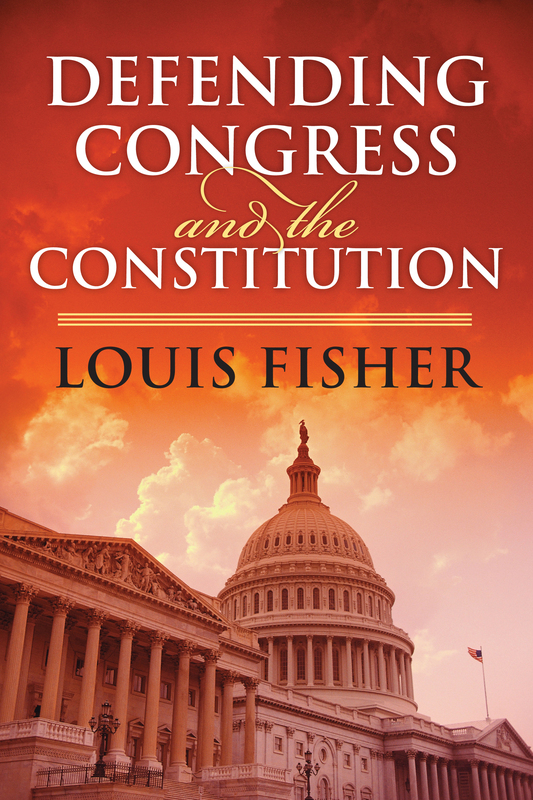 Our nation's leading authority on the separation of powers, Fisher offers a lucid primer on our nation's government and its executive, legislative, and judicial branches while vigorously advocating a robust reassertion of Congress's rightful role within that system. Drawing on a wide range of legislation, Supreme Court rulings, and presidential decisions, Fisher illuminates the contentious contest among the three major branches for power and control of government, presents a panorama of American history, and touches on issues as wide-ranging as federalism, religious freedom, and national security policy. Fisher is especially critical of the stereotypical view of the Supreme Court's decisions as possessing a kind of effectiveness and absolute finality that transcends the efforts and powers of Congress. Indeed, he argues that Congress, as much or more than the judiciary, has had a major positive impact on protecting individual rights in this country, while the judiciary has fallen short in such areas as child labor regulation and compulsory flag salute-or has attempted to settle a constitutional issue only to have it fester for years, breeding anger and resentment, until the political process forces the courts rethink their views. He highlights legislative accomplishments in many areas, often in the face of judicial opposition and obstruction, but also chides Congress for not protecting its key prerogatives over the power of the purse and going to war. In yielding to other branches, Fishers warns, lawmakers fail to represent their constituents and cripple the very system of checks and balances the Framers counted on to limit the destructive capacity of government. His book offers a wealth of forceful insights and provides an important reminder of and guide to how our government should really work. Louis Fisher is Scholar in Residence at the Constitution Project. He previously worked at the Library of Congress as Senior Specialist in Separation of Powers (Congressional Research Service) and Specialist in Constitutional Law (Law Library) and has testified before Congress fifty times. He is the author of twenty books, including The Constitution and 9/11 and Military Tribunals and Presidential Power, winner of the 2006 Richard Neustadt Book Award for Best Book on the American Presidency.